Out and about this evening and don't have time to edit down my two half-prepared posts, and then it occurred to me - but I've been using this stuff for the last two weeks, why not post about that! 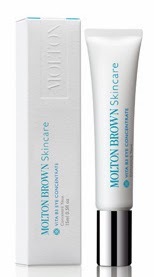 The Vita B3 Eye Concentrate from Molton Brown claims to do away with the appearance of dark shadows, lines and puffiness. Combining Vitamin B3 and ash bark complex to combat dark shadows and puffiness and a tetra-peptide complex to help reduce the appearance of fine lines... that's enough on the marketing spiel and on to what I found when I used it over the last two weeks. It has a gel texture and is immediately relaxing and cooling on application without making my skin tight. In terms of puffiness, I don't suffer from this, so I can't comment - however I have reached that magical, wondrous age (sarcastic, moi?!) when a switch-out of my skin care routine can have an obvious (if not immediate) effect, and this didn't. I did find it relaxing, comforting, nourishing, hydrating and moisturising under my eye area. Given the current state of my skin (hyper-dry) and the current season (winter, cold, miserable), I'm impressed by this performance from a gel-based product. Over the two weeks it didn't do anything in particular for my dark circles (nothing really does - in my case, they're largely caused by hyper-pigmentation), but it certainly didn't dis-improve my under-eye area. Would I recommend? Absolutely, definitely, why not! I have used up two weeks' worth of samples and would be happy to continue using if I had some remaining. Given how monumentally fussy I am about my under-eye products, I feel this is a good endorsement... Molton Brown is becoming a lot more available and I think this costs in the region of €55 for full size. Get a sample first - like all skin care products - and try it for yourself. Given how generous Molton Brown is with sample products when you purchase from them, you should manage to bag yourself several weeks' worth of skin care products, as did I, to try out!